To make iced tea, I used to steep tea in hot water then pour ice and cold water into a pitcher. Sometimes the tea would be bitter and I would need to add sugar. Little did I realize that the tea was bitter because I was steeping it for too long in boiling hot water to make it a concentrate. I just figured that’s how some iced tea tasted. Let me tell you about cold brewing tea. It’s how you should ALWAYS make iced tea. It’s so so good and it’s a complete game changer. I like to make about 2-3 day’s worth at a time (two tall weck jars). Every couple of days, I’ll start a new batch so that it’s ready once I’ve finished the previous batch. Any kind, from white tea to black tea to herbals. To filter out the tea leaves. Or a pitcher to steep and store the cold brewed tea. To measure out the loose tea leaves. 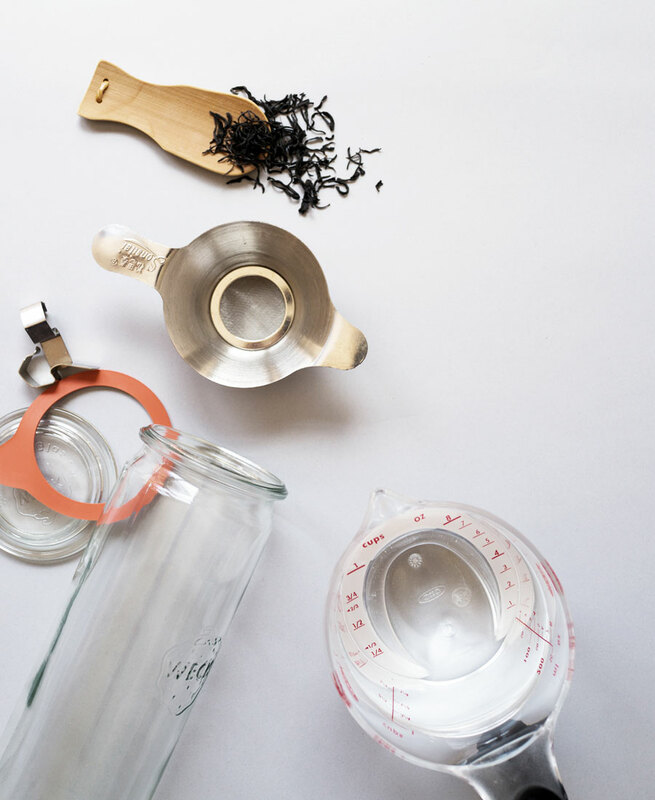 Cold-brewing tea is a slow and gentle steeping process that creates a sweeter and smoother tasting tea. Tannins, which can make tea bitter or astringent, aren’t steeped out of the tea in cold water the way it does in hot water. No more harsh or bitterness in your iced tea anymore! 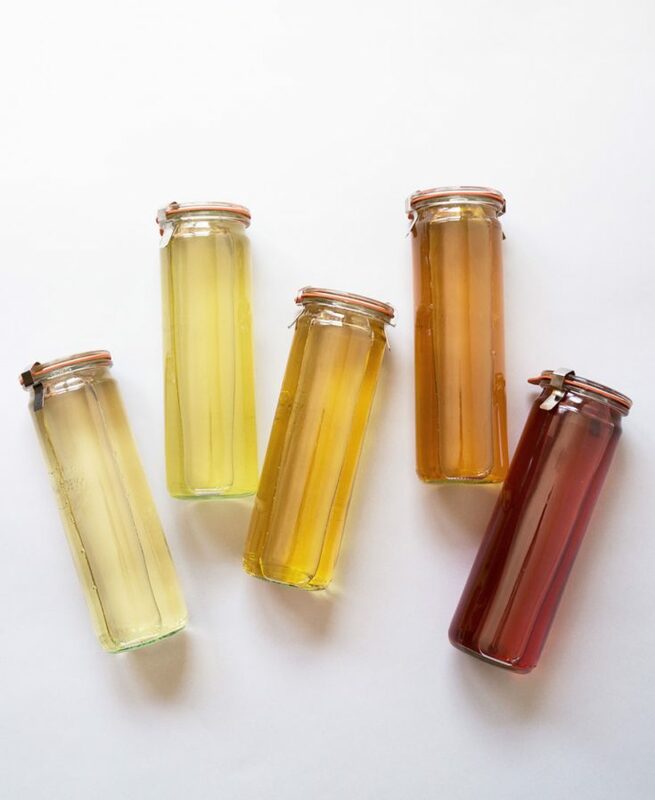 Because cold brewing doesn’t involve heating up anything on the stovetop, it’s nice and easy to make in the hot summer months. Making cold brew tea is also the fool-proof way of making iced tea. You can cold steep it for 8 hours or 20, it’ll still be delicious. There’s less caffeine in a cold brew tea (about half) than tea steeped in hot water. Good news — you can drink more of it without getting super jittery. The recipe for a cold brewed iced tea is more of a ratio since it just has two ingredients — water and tea. The ratio for cold brew is one rounded teaspoon of loose leaf tea to one cup of water. It doesn’t need to be precise and you can adjust if you like stronger or weaker tea. If you’re using tea bags, you can use 1-2 tea bags per cup of water. The tea I cold brew the most often, and what I consider the best tea to cold brew, is oolong with black tea coming in second. I love the complex, subtle flavors that come out from these two stronger flavored teas. Here are my recommended teas to cold brew. Loose Tea or Tea Bags to Cold Brew? 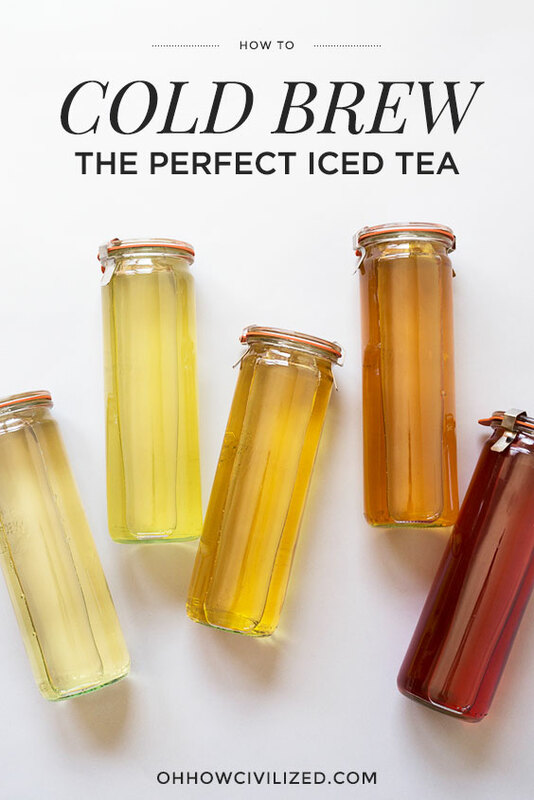 If you’ve only used tea bags for iced tea, you’re missing out! The loose leaf cold brewed teas are so much better. Loose tea in general is a much better quality tea than what you’ll find in tea bags. Loose tea is a whole tea leaf. You can see the actual tea leaf after it has been steeped and unfurled. You get the most essential oils and aroma from a loose tea therefore it’s a better and more complex tasting tea. Due to it’s high quality, loose tea can be steeped multiple times. It costs more than tea bags but you can cold brew it more than once. Tea bags on the other hand are bits and pieces of broken tea leaves, filled with ‘tea dust.’ Tea bags are a lot less flavorful and are usually a lot bitter than loose tea. Low quality teas are what’s used in tea bags so it’s a lot less expensive. Because loose tea is a better and more flavorful tea, I prefer it in cold brews than tea bags. 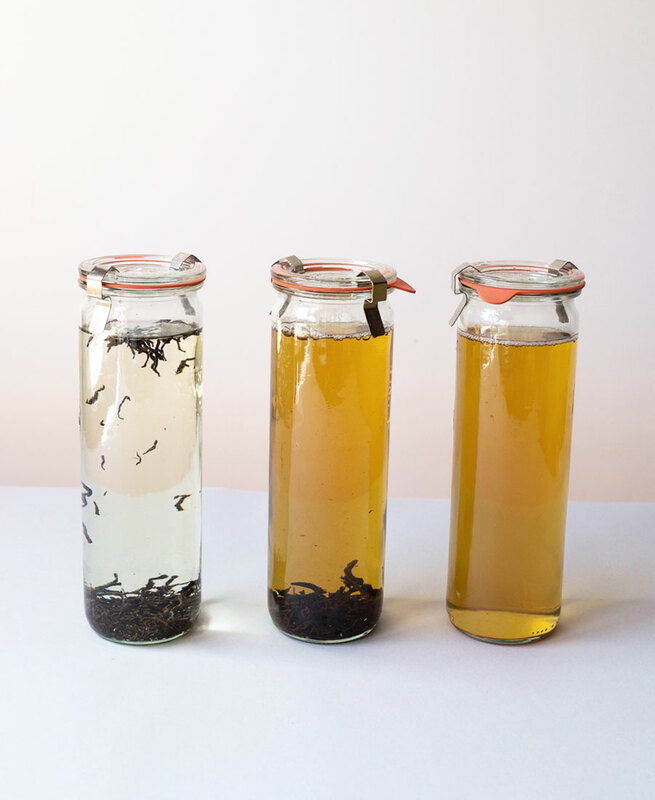 Make and store your tea in glass containers. I like to use these tall Weck jars so that I can strain out tea from one jar to another. Adding ice when serving the cold brew is optional. When it’s super hot out, I’ll add some ice to keep it colder longer but usually I don’t add ice at all to the cold brew. If adding a sweetener, use simple syrup since sugar and honey can be hard to incorporate completely. 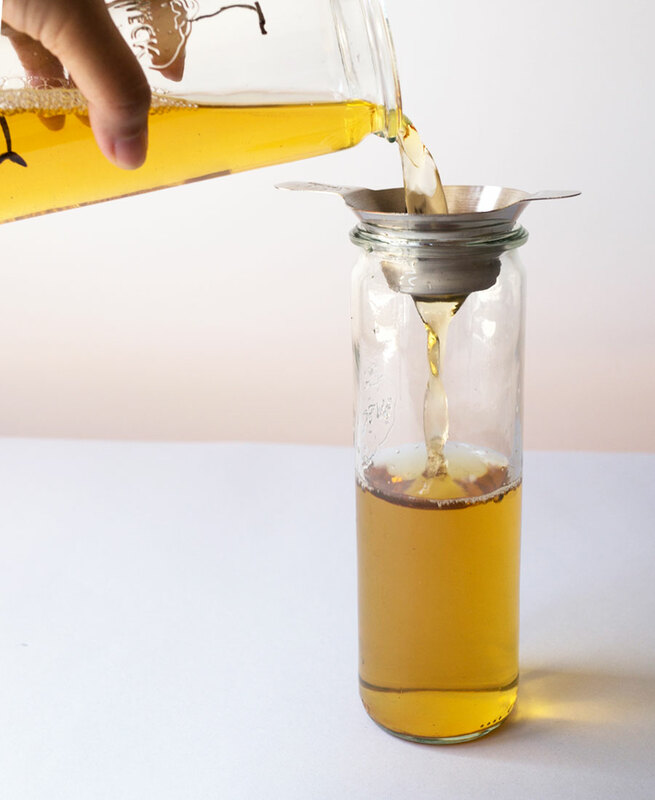 Step 1: Put loose leaf tea into a glass container with room temperature or cold water. Step 2: Cold brew tea by putting container with tea and water into the refrigerator for eight hours or overnight. Step 3: Strain tea leaves and you’re left with gorgeous cold brewed tea. If you want to go the extra mile, do a quick rinse using hot water to clean the loose tea leaves before cold brewing. (This step isn’t necessary if you’re using tea bags.) All you need is 5 seconds for the rinse. And if you want to take it a step further, after you’ve filled the container with tea and water, let it sit for an hour at room temperature before putting it in the fridge. You can reuse the tea leaves if it’s loose leaf tea. Just strain out of one container and just add it into another with water. If I see that the tea leaves haven’t unfurled much, I’ll use it again for the next batch. 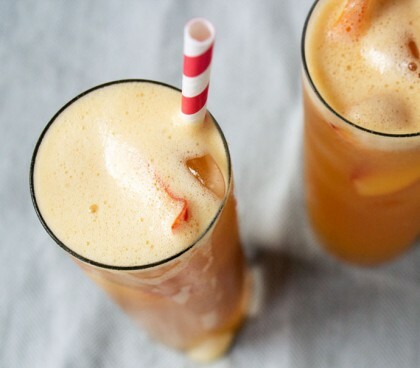 How to make the best iced tea -- cold brew it! In a pitcher, stir in loose leaf tea into cold or room temperature water. Cover and refrigerate for about 8 hours or overnight. Strain out tea leaves and discard or reuse. If using tea bags, discard. 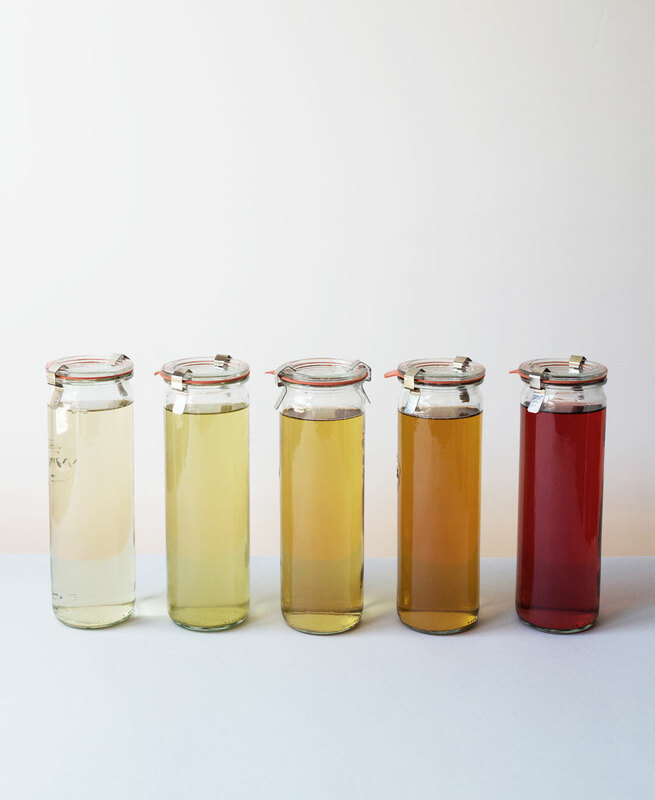 Cold brewed tea can be stored in the refrigerator for up to 5 days. Where did you get those containers and strainer? Hi Stephanie, I got them from Williams Sonoma. Great summary! What are your thoughts on brewing at room temperature vs in the refrigerator? I tend to do my coffee at room temperature on the counter but my tea in the fridge but I’m curious if anyone here prefers tea at room temperature? Hi Chip, I like my tea either hot or cold so I’ve never tried to brew it at room temperature although I know some people like to brew it at room temperature for a couple of hours before storing it in the fridge. If you like yours room temperature, I don’t see any reason not to brew it that way! 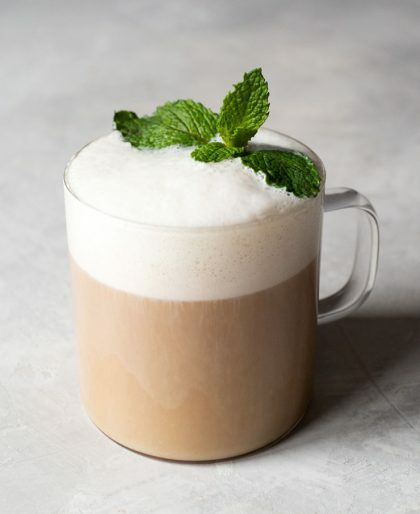 Would it be okay to add a simple syrup to my loose tea iced tea and if so should i wait for the syrup to cool down to room temperature before adding it to the cold brew tea. Hi Lenny, best to wait till the simple syrup cools down a bit before adding into your iced tea but if you’re in a hurry, you can just add more ice. And yes, definitely ok to add the simple syrup to your iced tea if you prefer. I usually make a 2 quart (usually 8 cups all together) pitcher of cold brew tea what would be the right amount of equal parts sugar and water for my simple syrup that would give me just the right amount of sweetness but not overly sweet. Hi Lenny, it’s a little hard to say since everyone’s idea of the right amount of sweetness is a bit different. I would start with 1/2 cup of sugar for the 8 cups and adjust from there. Hi Lenny, you can probably go up to 48 hours but I wouldn’t do it for longer since the cold brew would be too strong. Hi Abdulazis, you can use simple syrup which is half sugar (you can also use honey) and half water that comes to a boil on a stovetop. I’m making an 8 cup pitcher of loose tea iced tea by adding 1 teaspoon of loose tea for every cup so basically i’m using 8 teaspoons but if i wanted to make a stronger tasting tea how much more teaspoons can i add to the pitcher. Should i double that amount (16 teaspoons) or less than that. Hi Lenny, I would double if you want it to be super strong. But if you just want iced tea that’s stronger than normal, I would go with 12 teaspoons for 8 cups. Did you ever receive my last 2 messages to you, thanks. Why steep the tea at least 8 hours or overnight instead of less than the minimum of 8 hours, just curious. Hi! How long it last the ice tea in the refrigerator after the cold brew? It would be better to add the fruit and the leaves of mint or basil when i am going to serve it if i want my ice tea last longer? Thank you! Hi Florencia, the cold brew will last up to five days in the refrigerator. You can cold brew with the fruit and herbs for 2 days (you want to make sure the flavors get a chance to infuse into the tea) then discard so that it’s not in the cold brew for the entire 5 days.